Troy Phelan, a cynical billionaire who has grown tired of living, jumps from a skyscraper after signing a simple will that leaves his massive fortune to an illegitimate daughter whom his family knows nothing about. Only a pittance is granted to his other children, and not a penny to his ex-wives. Rachel Lane has grown up not knowing her father, and is a missionary to a remote tribe of Indians in South America. The majority of the book covers the search for the elusive missionary, and her reaction to the inheritance. Nate O’Reilly is the lawyer that is sent down to Brazil to locate Rachel. His life is a total mess – twice divorced, estranged from his children, in trouble with the IRS, and newly released from a detox program. The sub-story line about Nate’s life is just as intriguing as the main plot of finding Rachel. The stories intertwine perfectly as Nate and Rachel finally meet. The book switches back and forth from the United States, where the Phelan children are legally contesting the will, to South America, where Nate is traveling through the Pantanal area looking for Rachel. He encounters difficulties of all varieties, making it a hellish trip. 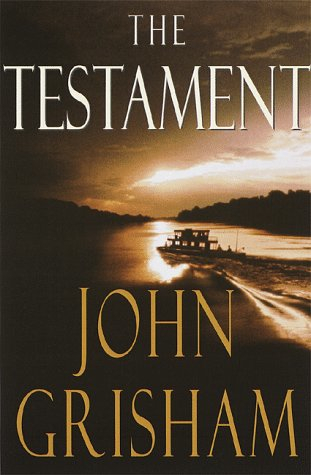 I thoroughly enjoyed “The Testament”, both in book form and as an audiobook. Frank Muller is the narrator, and performs to perfection. His reading is animated, as if he really is the character he is reading. Mr. Muller was the narrator for a number of popular novels, but was injured in a serious motorcycle accident in 2001, from which he never fully recovered. He passed away in 2008, leaving “The Testament” as some of his finest work. Whether you read it in printed or audio version, you’re sure to find this one of John Grisham’s best novels. 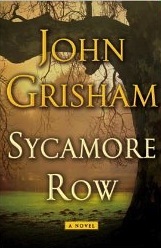 Anyone reading “Sycamore Row” will be struck by its connection to earlier novels. Attorney Jake Brigance and Sheriff Ozzie Walls are brought back from the very first Grisham novel – “A Time To Kill”. Judge Atlee is brought in from “The Summons”. Lawyers Harry Rex Vonner and Lucien Wilbanks from “The Last Juror” assist Jake in preparing his case. And the former owner of the Ford County Times, Willie Traynor, has a small part in the story. Clanton is a town that struggled with racial issues in “A Time To Kill”, and years later, it is still an issue. The story centers around the suicide of Seth Hubbard, who had advanced lung cancer. The day before he hung himself, Seth invalidated his traditional will with a new, handwritten will leaving almost his entire fortune to his black housekeeper, Lettie. Needless to say, this did not sit well with Seth’s children and grandchildren, who took the matter to court. Much of the book is preparation for the trial, but the story easily kept my attention from beginning to end.